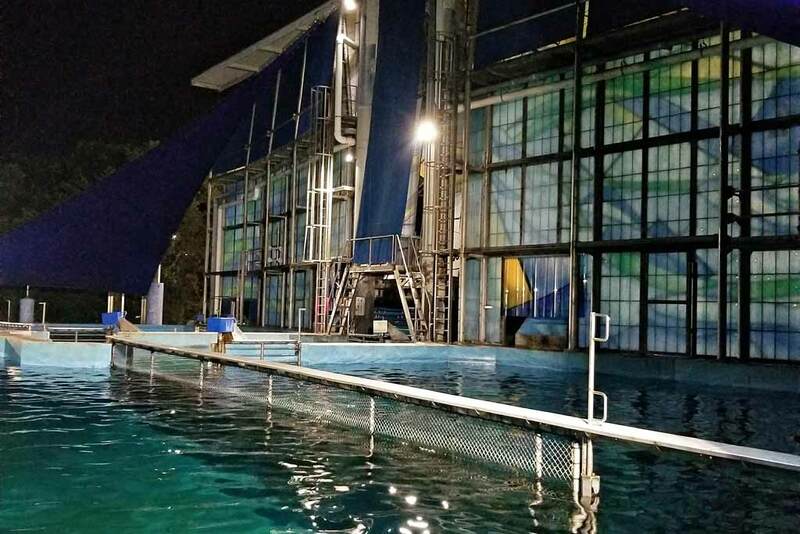 We participated in the SeaWorld Overnight program in San Antonio and it was a blast! 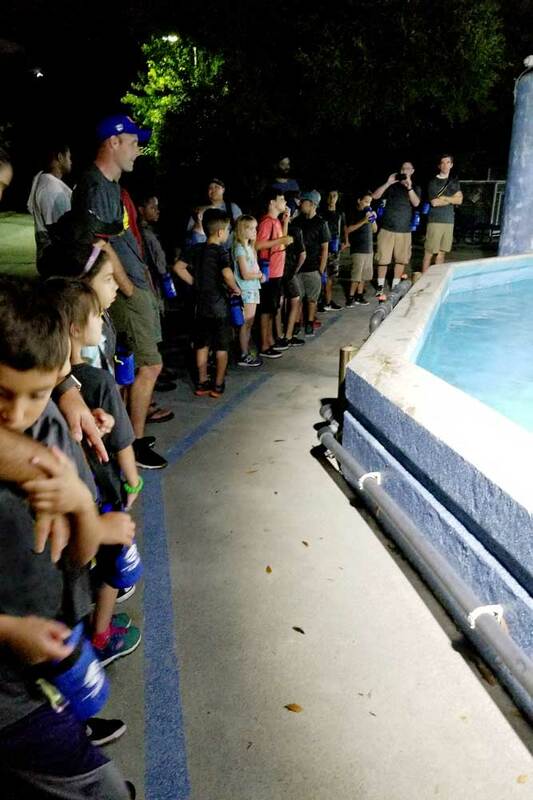 Our scout group is really active, even throughout the summer, but we try to keep it fun.� SeaWorld Overnight was definitely fun! 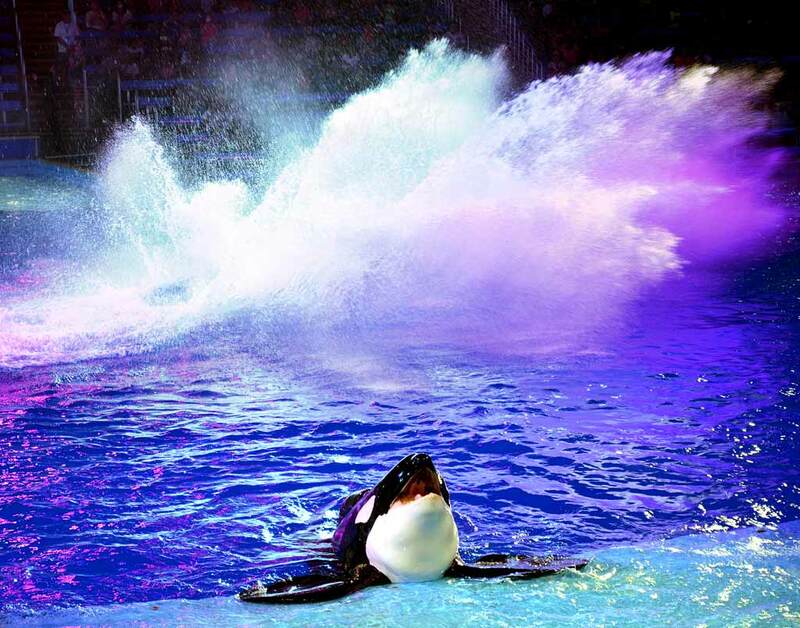 The program was well run and reasonably priced and not too far from Houston.� This experience is in reference to their 2017 summer offerings it is possible that the prices or schedule have been updated so please contact SeaWorld directly for current program details. 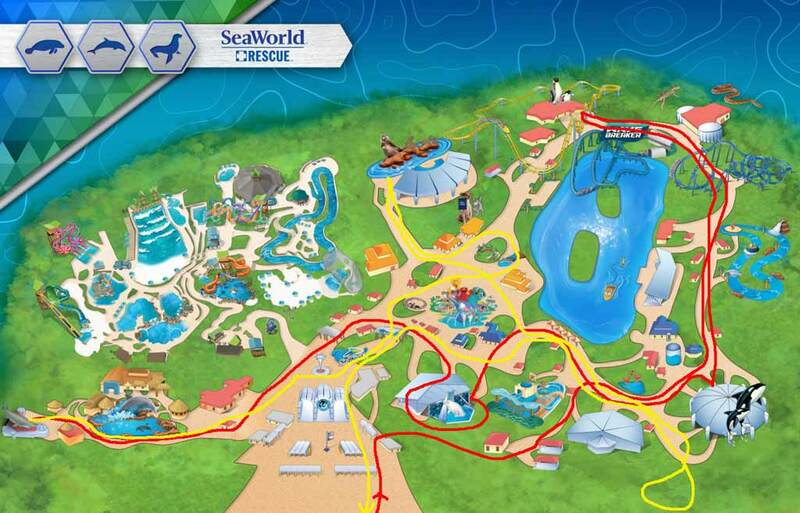 Booking your SeaWorld Overnight is fairly simple, but know that you do have to originate the process with their main number which will send you to the Florida call center.� This was probably the most annoying part because of the wait and hold times. It was also a little nerve-racking for me as I wanted to be sure I was booking everything as locally as possible.� But, no worries, once you are in the system you will be contacted by a local Program Assistant with a direct phone number and email.� So further contact, follow-ups, random questions will be answered in a timely and easy to access fashion. If you’ve booked group overnights you will realize prices vary wildly so we were pleasantly surprised that the program price was very reasonable.� We paid $80 per student participant and $50 per adult.� This price included (for adults and participants): Pizza dinner on Saturday night, breakfast tacos Sunday�morning, a camp water bottle, a SeaWorld camp t-shirt, and a 1-day parking pass. There were also several add-ons available.� You could get a park ticket for $36 per person for use on Saturday before the program or Sunday after the program.� And there was a behind the scenes tour for $10 per person that began after the regular program ended Sunday morning. The SeaWorld Overnight program has their own participant forms they need completed and brought in hard copy to the program for adults and minors.� This is where I got a bit off as the paperwork says the program needs them 5-weeks in advance so I emailed them.� Unfortunately, I did not bring hard copies (which it also says to do in another place) so we had a bit of a hiccup getting those printed and downloaded, but everything worked out.� However, save yourself and group some trouble and just bring copies too. Additionally, you’ll need to send them a list of drivers and they will send you a parking pass that you will also need to print out, disseminate to your group, and each person will need to bring it to present at the gate and place in their window. And, lastly, you will need to send them your t-shirt sizes so they can have them ready.� Don’t stress over perfect sizes as they can make adjustments on site.� I have a feeling they must have boxes and boxes of t-shirts sitting around. The gate at SeaWorld has changed from my youth. 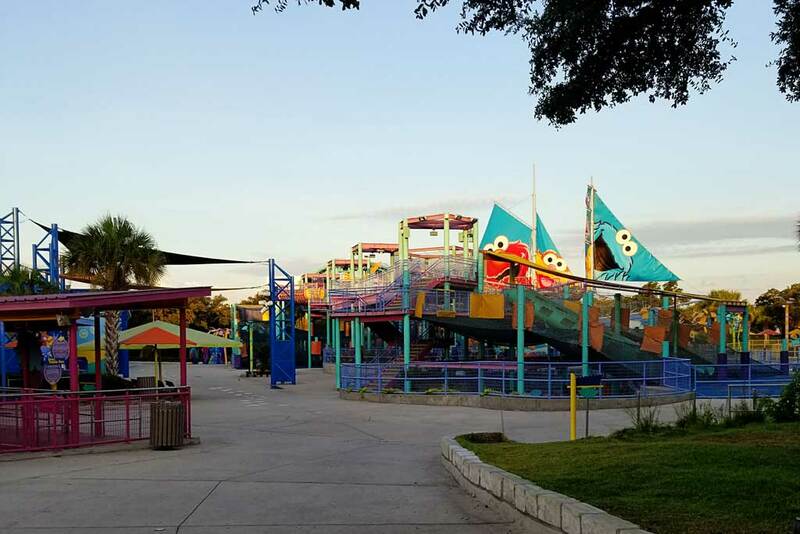 You no longer get your tickets scanned at the main gate.� It is now done further into the park to accommodate�different tickets (waterpark vs. regular park, etc.). We were instructed to unload our gear (nicely wrapped in trash bags with our names on them) in front of a blue awning and then park nearby.� The program representatives will meet you out front at the drop-off area as they will bring a van and toss all of your things into it and transport it to the sleeping area for you.� So, obviously, nothing bulky and weird is allowed like air mattresses or coolers.� Just your bags and sleeping bags. The Program assistants that are not taking away luggage then get assigned to groups and your program begins at 5:30 pm. Wear comfy shoes you will likely walk the entire park. The red path is day one and the yellow path is the morning of day 2. Unfortunately for us, that is about the time a great monsoon hit. The park shut down and we had to shelter in place near the front bathrooms for about an hour and a half.� The kids loved it!� Not so much, but nothing to do about that. 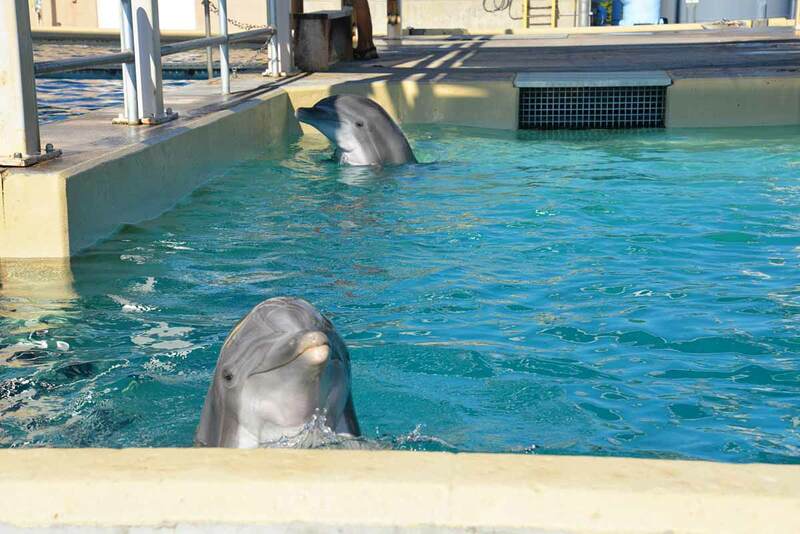 After we left the dolphins we walked across the park to Explorer’s Reef. The building that houses the shark and coral reef aquariums.� This is where we spent the night.� There were other options available as well but for smaller group sizes. The building is quite large and loosely separated into two chambers. The coral reef side and the shark side.� At this point,�we retrieved our bags and set up “camp.”� The reef lights are turned out for sleeping time so it is pretty dark, but you are in a giant room with loads of people so earplugs and eye masks are a good idea if you have trouble sleeping in those situations. The program assistants sleep in the entryway room so they are available if necessary.� Also, you’ll have to go through there to exit the building in the event of nature calling.� The bathrooms are outside in a nearby building. 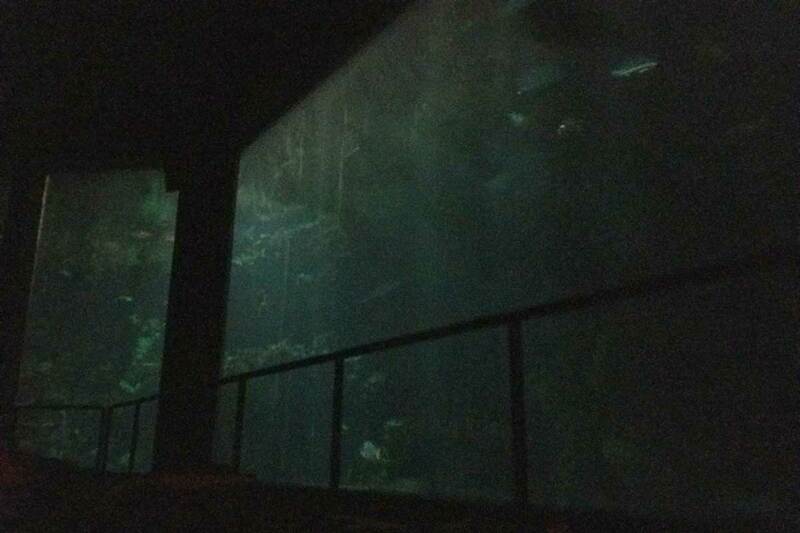 The reef after lights out. 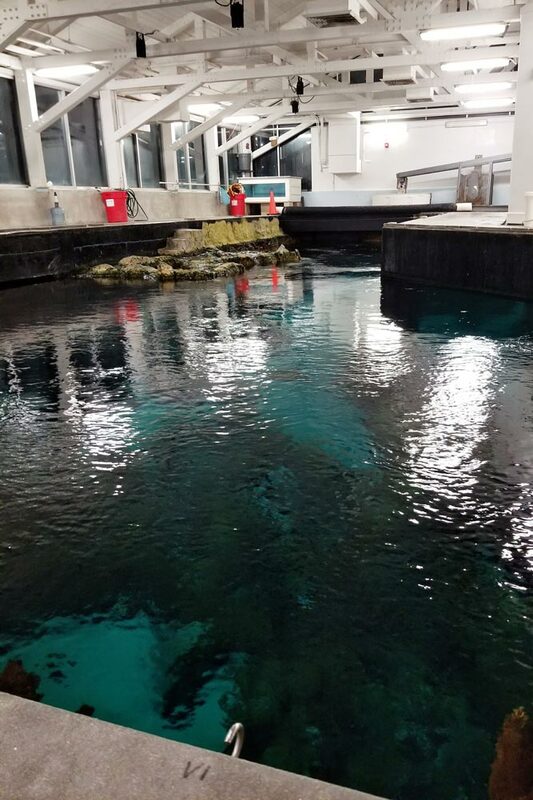 For those not quite ready to turn in, there is another behind the scenes opportunity.� This one takes you on a tour of the maintenance of the large shark and coral reef aquariums.� You get to see the staging areas where the trainers set up food. The board that shows which animals get what and a view from the top. Very cool. Lights out are at 11:30 p.m. And, believe me, the kids are ready! Upon wake up, you get your camp t-shirts. Almost all the kiddos immediately put them on!� Then it’s breakfast and a visit to another animal area.� We headed over to Pacific Point Preserve, home to the seals, the sea lions, and one otter who�seemed a bit inconvenienced to be seen so early. One of the neatest parts of this walk is seeing the park completely empty. 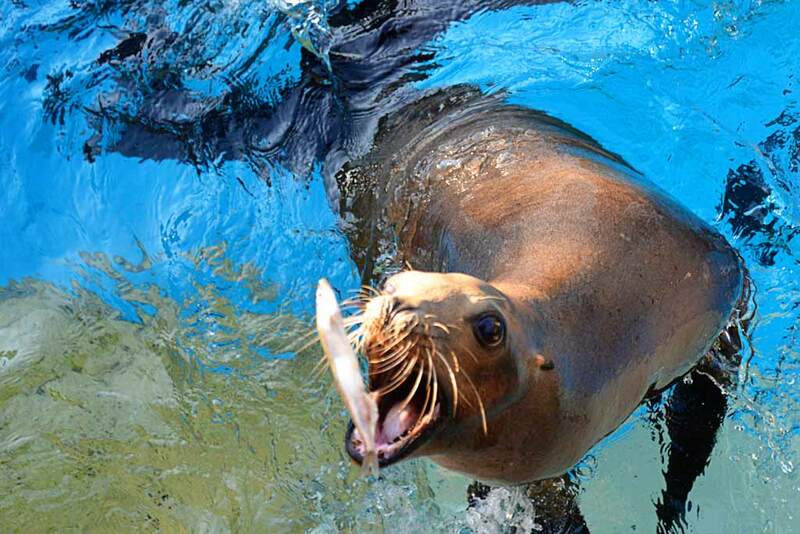 Once we arrived the seals were pretty uninterested in us but the sea lions were ready for the people.� Or the fish that the people provide!� Everyone was provided with a tray of fish and plenty of time to feed the sea lions and explore the area. At this point your SeaWorld Overnight is over. Unless you are taking the add-on Behind the Scenes tour.� Which we were, so, onward! 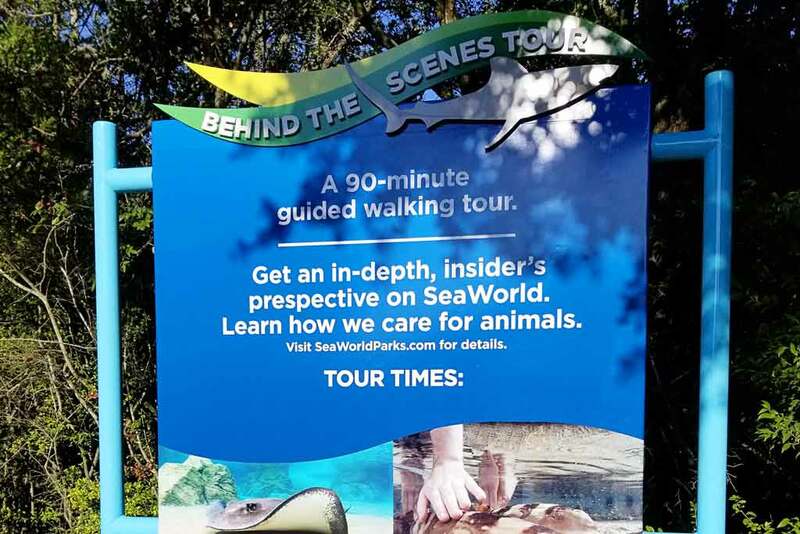 The Behind the Scenes tour is back across the park near the orca and dolphin stadiums. In fact, it’s behind them.�Off the paved road (actually, it’s all paved).��So, we hiked back across the park. 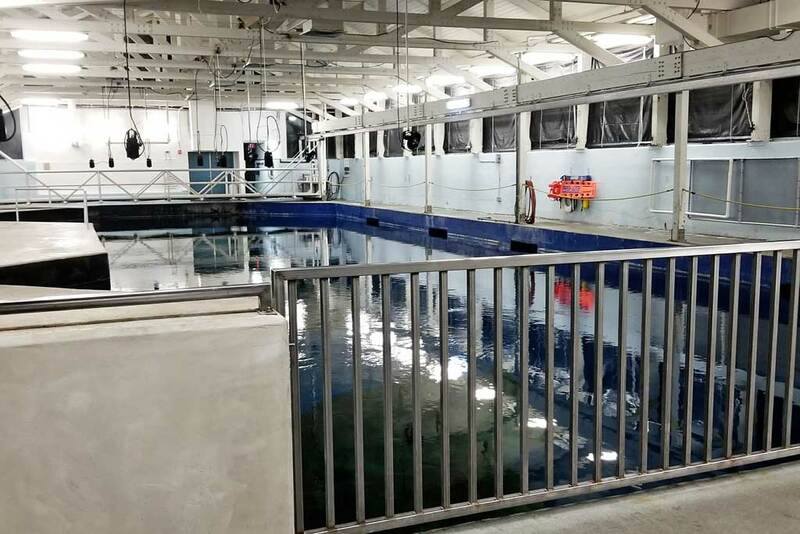 It’s a lengthy walk back to the tanks but completely worth it.� There are several off-display animals back there and then the training and quarantine tanks.� The tour shows the type of transport sling used to move large aquatic mammals and then heads to the stingray tank.� Where they swim in circles and all the kids try to touch them! 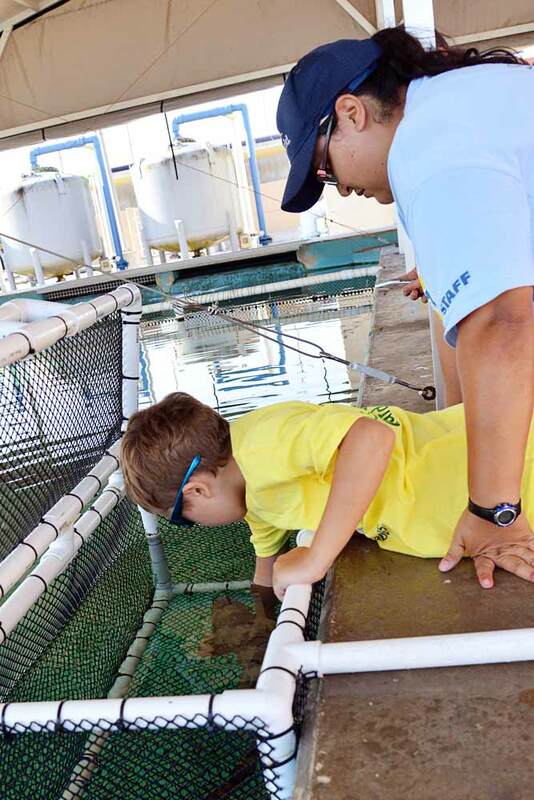 After the stingrays, we headed over to touch a shark.� Yes, a shark!� My kiddo was elated.� A little hesitant, but excited nonetheless. 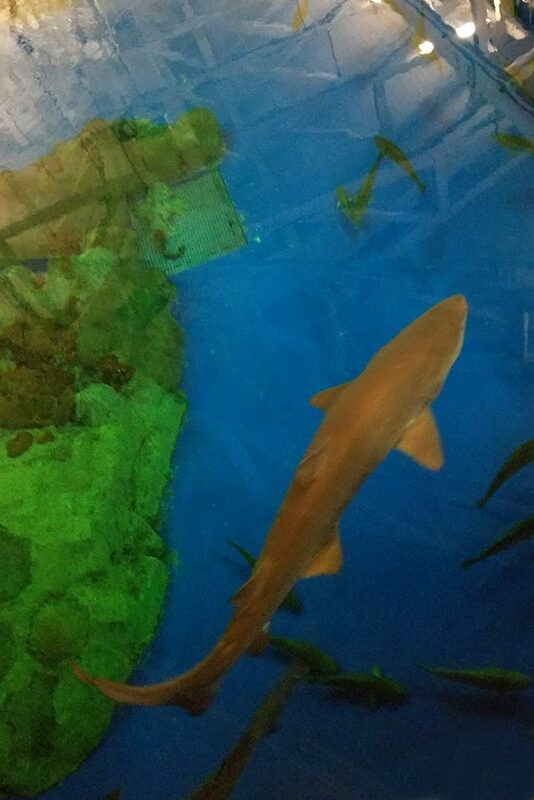 The shark is in a little pen and the kids can climb up and reach into pet it. Our tour ended with a trip by the dolphins.� They were total showoffs.� I think they were trying to get everyone wet.� Thank goodness for that blue line on the ground! 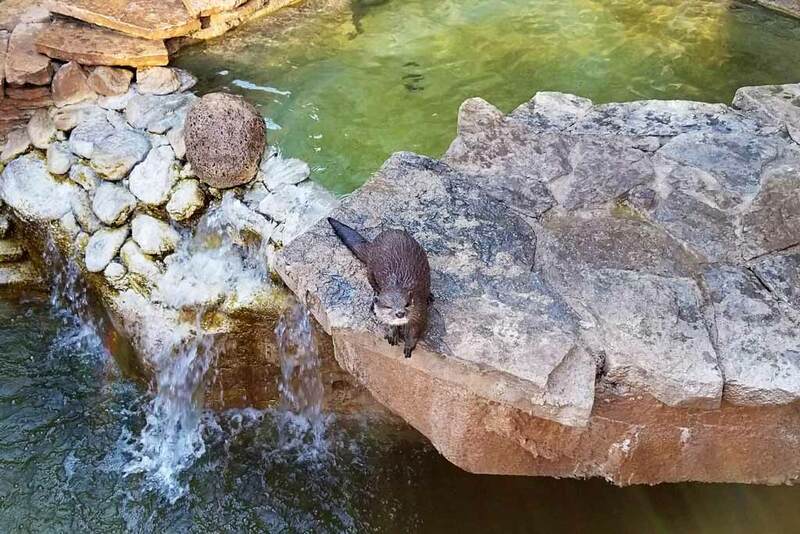 And, this concluded the tour and the SeaWorld Overnight program.� We were escorted to the front gates to retrieve our bags that were brought up, by van to the dropoff area, and then departed. 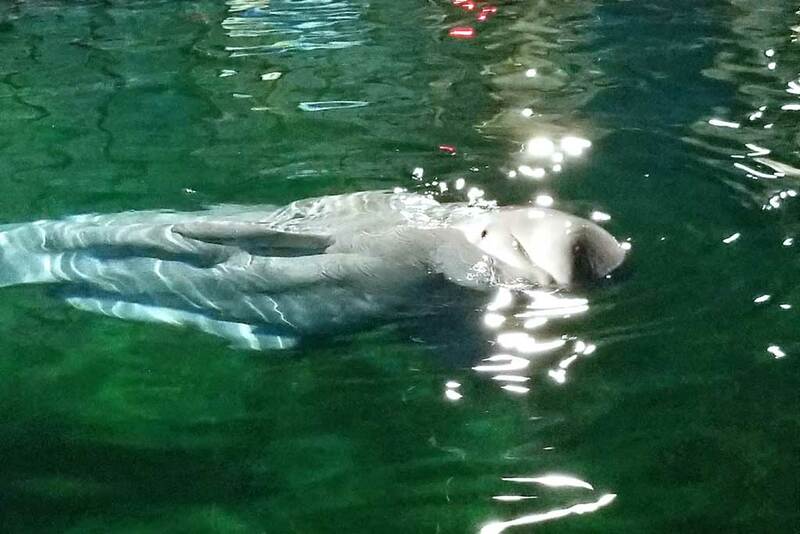 It was one of the best overnight group experiences that we have enjoyed and it is the one that most people continue to comment and ask when we’ll go back.� SeaWorld has their program down. It runs smoothly and is a great value! 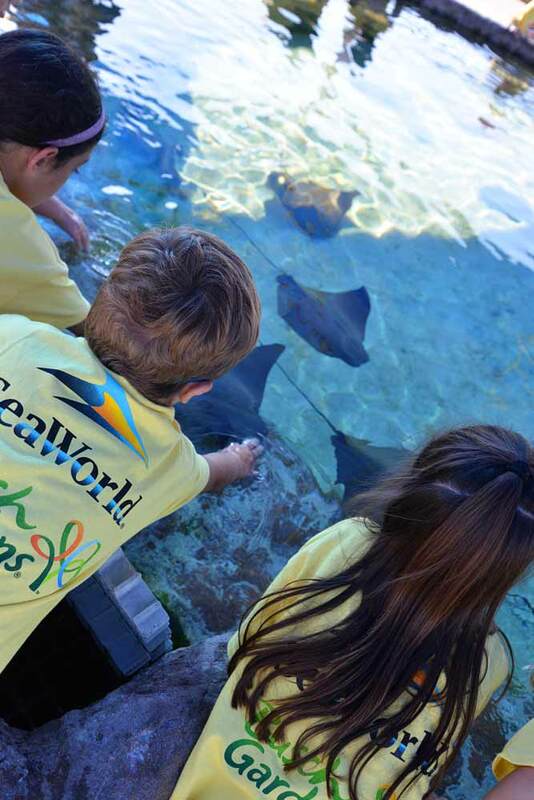 To book your group’s program visit the webpage for SeaWorld Overnight Programs. This is not a day at the park.� There will not be stops for rides, food, or shopping. If you want a park experience buy the add-on ticket. Check-in may not be under a blue awning.� Many of the awnings were missing.� Just unload out front on the drop-off drive, to the right. They’ll find you.